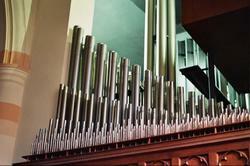 Nicknamed the "Mighty Moller," our organ was designed by then organist Edwin Starner and built and installed by the M.P. Moller Company of Hagerstown, Maryland in 1969. The organ was completely refurbished by the Peragallo Organ Company of Paterson, New Jersey in 1990. The original 1969 organ was never completed as the antiphonal and celestial division stops were left with no pipes. In 2000 the organ's antiphonal and celestial divisions were finally completed with digital voices and installed by the Walker Technical Company of Zionsville, PA. The instrument is comprised of six divisions: Great, Swell, Positiv, Antiphonal, Celestial, and Pedal. The instrument includes 63 stops, 45 ranks of pipes, antiphonal digital ranks, with 2,682 speaking pipes.